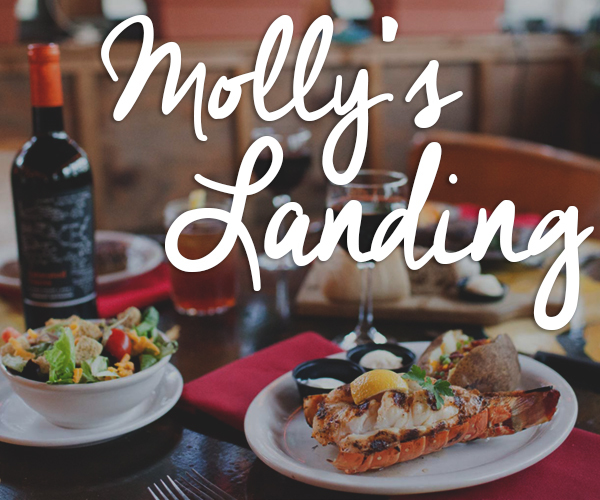 Home > Features > What Would You do if a Gorgeous Girl Invited You to Dine at Olive Garden? What would you do if a really gorgeous girl invited you to dine at the Olive Garden? Some people might take a Faustian perspective and say that’s like selling your soul to the Devil. While I don’t believe that the Darden Corporation is Satan, I do think that, if Satan finds the time to laugh each time mankind’s potential for joy, greatness and beauty is crippled, fettered, or destroyed, then Olive Garden is always good for a snicker. 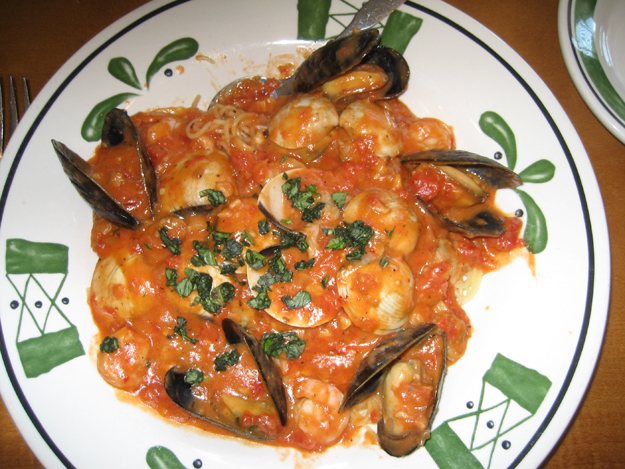 One out of every three meals eaten at an Italian restaurant in this country is eaten at Olive Garden. That’s a lot of mom and pop places put out of business. I’ve eaten at some of those places deep in the heart of Italian Brooklyn, and they are REAL family. Still, while nothing can beat the chef of one of those Brooklyn joints coming out and yelling, “Hey Brian! Where you been? It’s been two weeks. 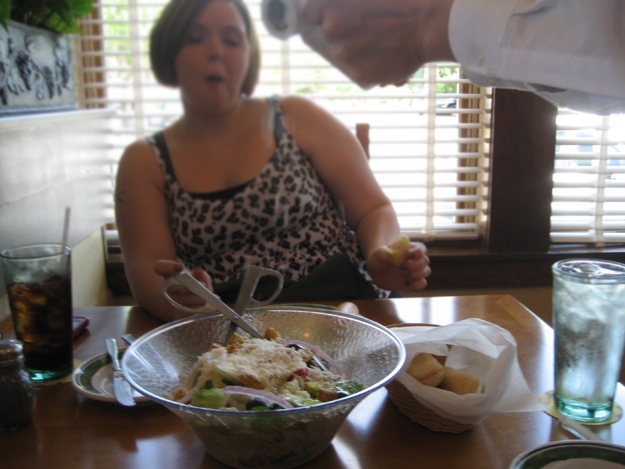 Whatsamatter, you don’t like my food no more?”, the service at Olive Garden is surprisingly good. The waiters are friendly, the waiters are helpful, the waiters are not corporate clones. They’re just ordinary guys from Tulsa and the ‘burbs. Usually they don’t upsell the food. (In fact when I requested a dinner menu, they reminded me that I could get cheaper options by ordering from the lunch menu.) The decor, a slouchy warren of long, beige rooms, was designed by experts at corporate HQ to be pleasant, and pleasant it was. And then there’s the salad. Bowl after bowl of it. It’s great. Here’s our second bowlful. They even grate cheese on it. 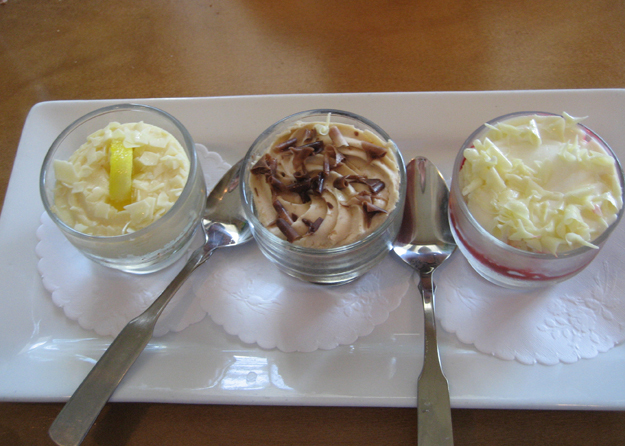 No, the salad dressing isn’t going to steal the salad crown from Tucci’s lemonata but still, it’s worth eating. There’s also an all-you-can-eat deal on breadsticks, tempting little soft baguettes still hot from the oven. They lack the crunchy chewy crispness of artisanal bread, but they’re not bad at all. It would be nice to make a meal of bread and salad. At lunch I think you can. If not, there are the entrees to deal with. Some have heavy cream sauces and I know from experience that they leave a bad aftertaste. So I got this. Capellini di Mare ($16.25) This is billed as “shrimp, clams and mussels sautéed in white wine, garlic and a zesty marinara sauce. Served over capellini and topped with fresh basil.” Like a lot of the sauces here, the allegedly zesty marinara had a viscous sheen which made me think of sauces vacuum-packed at a big factory and microwaved at the restaurant. (Does Olive Garden do this? I just don’t know. There’s nothing reliable on the subject, though a lot of allegations are out there. Besides, sous-vide cooking is considered gourmet nowadays.) But when mixed with the angel hair pasta it lost its gloppy aspect and wasn’t bad at all. I couldn’t taste basil but there was certainly fresh garlic in there. A lot of it. The shrimp, mussels and clams were fresh and there were a lot of them. She who brought me here got this. Chicken Parmigiana ($13.50) Described for those who don’t know as “parmesan-breaded chicken breasts, fried and topped with marinara sauce and mozzarella cheese. Served with spaghetti.” Slightly dry, but not too bad. If you’re selling your soul you’d better get a good dessert. And here the Olive Garden delivered. These were really good. We fought over them. There’s a spiffy glass-walled Olive Garden at the best location in Times Square. I spent years in New York right nearby and never once went in. But Tulsa is different. 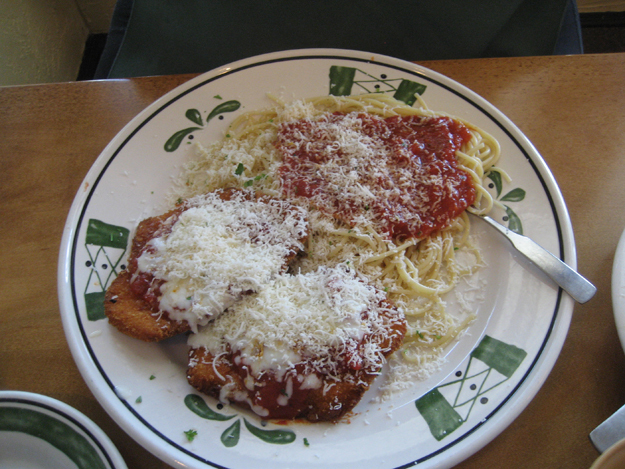 If you want Italian food at 3 PM on a weekday, Olive Garden is the best around.